Good dental hygiene can increase your pet's health, vitality, and well-being and add additional years to his or her life. 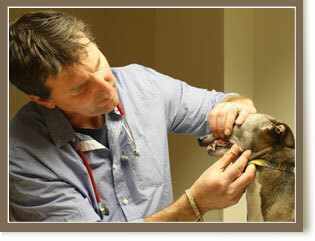 That is why regular dental care is an important piece of your dog or cat's preventive health care program. If left untreated, dental disease can not only be painful and inhibit proper nutrition, but it can also lead to serious systemic issues that may threaten your pet's health before symptoms are noticeable. For example, oral bacteria that enter the bloodstream can damage your pet's kidneys, heart, or liver. It is estimated that more than 80 percent of dogs and 70 percent of cats develop tooth and gum disease by the age of three years. Proper dental care not only prevents dental and systemic disease, but it also helps minimize the lifetime cost of care for your pet. And, of course, it also helps with that bad breath problem, which will make your furry pal even more popular around the house! Dr. Siegel and his staff believe that the centerpiece of good dental care is a complete oral exam, which might be followed by a thorough cleaning designed to remove plaque and slow its buildup. In some cases, when a pet is cooperative enough, much tartar can be removed in the exam room while the pet is awake! This is something that can be done yearly or even more often to keep up with dental health. Let us know when you make your appointment if you are interested in exploring this option. In other cases we may recommend a thorough cleaning both above and below the gum line, including polishing and removing very diseased teeth, which is done under anesthesia. Many pets need this done at least a few times in their lives to keep their gums and teeth healthy. Often owners notice a big improvement in their pet's energy level and happiness after "rotten" teeth are removed, even if the pet didn't seem painful beforehand. We also have several options available to help keep your pet's teeth clean at home, such as special treats, diets, chews and toothbrushes. As always, we will make your pet's individual health situation and your comfort as our first priorities as we discuss with you how to best care for their teeth and gums.